MANILA, Philippines (CNS) — Like many others in the town of Jetafe, Father Chito Lozada and his staff at Santo Nino parish did not go inside their homes Oct. 15; they remained outdoors. They feared aftershocks that continued after a magnitude 7.1 earthquake struck earlier in the day. 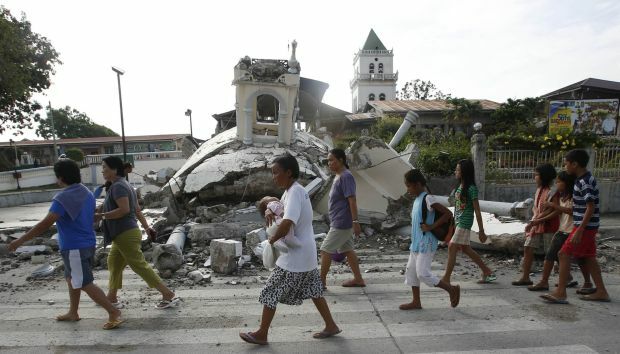 “(The aftershocks are) really coming quick,” said Father Lozada, who directs the social action office of the Talibon Diocese in Bohol. Although they are not nearly as intense as the powerful quake, he said they have made people of the diocese, which includes Carmen, the site of the epicenter, jumpy. “They are making their own evacuation center in the place where they think they are safe, without edifices, without posts. They themselves are gathered there,” he said. Parishioners from Santo Nino converged mostly in the town plaza and they were not budging, he said. The 43-year-old priest was born and raised in Bohol, a popular tourist destination, and he said this was the most severe earthquake he had ever experienced. He said he could barely keep from falling over while the temblor shook the ground. He said houses were flattened and several centuries-old churches in the diocese suffered partial damage, with some facades and belfries crumbling to the ground. Father Lozada said the diocese is making an appeal for food and water for its parishioners. The Philippines’ Department of Social Welfare and Development announced it had a few thousand food packages to distribute, and it was purchasing more provisions for the anticipated rise in the number of evacuees. The commander of the Armed Forces Central Command said in Bohol alone, more than 130 people had died. Maj. Gen. Roy Deveraturda said about two dozen people were missing. He said emergency workers had to take more roundabout routes because of the impassible roads. Deveraturda did an aerial survey of the devastation in Bohol Oct. 16, and he told CNS by phone that people were remaining on the outer perimeters of their houses. The Civil Defense office said more than 2.8 million people have been affected in the three worst-hit areas. One of those areas, Cebu City, a 20-mile boat ride northwest of Jetafe, also sustained partially collapsed buildings, broken roads and damaged shopping malls. Cristy Layan works at a mall restaurant in Cebu. She said the mall, which suffered cracks, was open for just a few hours Wednesday before officials ordered it closed again so that a more thorough structural inspection could be done. Layan said she was sleeping when the quake hit and she woke with a start, while her roommate’s coffee cup fell out of her hands. The 23-year-old said the aftershocks that followed seemed endless compared to those she experienced in February 2012 when nearby Negros Oriental province experienced an earthquake. Layan and her roommate live in a boarding house with 15 residents, and she said Oct. 16 that residents have left the front door open because they keep exiting the building whenever they feel the aftershocks. “We don’t even bother to change to our house clothes,” said Layan. “We leave with our insurance papers in our hands.” And, she said, they have all been praying. Layan said the priority was to keep the small children who live next door safe. They set up tents outside where the children could be taken in case any major aftershocks strike. The head of the Philippine Institute of Volcanology and Seismology has said the worst of the aftershocks would be over within three days of the quake. Some churches in the Archdiocese of Cebu canceled Masses as a “precautionary measure,” Msgr. Achilles Dakay, spokesman of the Archdiocese of Cebu, told ucanews.com. Masses were being celebrated outside of churches as authorities assessed the fitness of the structures. In Cebu City, the earthquake damaged the Basilica Minore de Santo Nino (Basilica of the Holy Child), the oldest church in the Philippines and home to one of the country’s most important religious icons. Social media users in the Philippines and around the world sent messages to pray for the quake-affected central Philippines known as the Visayas, where Bohol, Cebu and more than a dozen other island provinces are located. The Philippines forms part of what is known as the Pacific “Ring of Fire,” a region vulnerable to frequent earthquakes and volcanic activity.